What do you think of the new line up on the judging panel? Ant: They all interact really well, and know exactly what they’re looking for. Also, David Walliams constantly flirts with Simon which is very funny to watch! Have you enjoyed having Simon back? Did you miss him? Dec: It’s been great to have him back. He has a unique knack of saying what everyone is thinking at home. Ant: He hits the nail on the head every time with his critiques. I don’t think we realised how much we missed him until he came back. Which of the new Judges surprised you the most? Dec: The most surprising thing is how quickly they all gelled. They all got on really well from the first session. There was a real rhythm and chemistry immediately. Ant: We’re slightly surprised at how harsh Alesha can be. She knows her stuff, especially with the dance acts. She gets very technical with them. She’s also very honest, doesn’t dress things up and isn’t afraid to push that buzzer! What do you think of the talent this year? Ant: Very good. We’ve been really pleased with the level of talent all the way through; it’s definitely a step up from last year. Dec: There’s a lot more variety this year, lots of different acts. They should make for some very interesting semi-finals. Dec: There’s been some very good singers and musicians. We’ve also seen the return of the ukulele! We’ve had a few ukulele players audition. 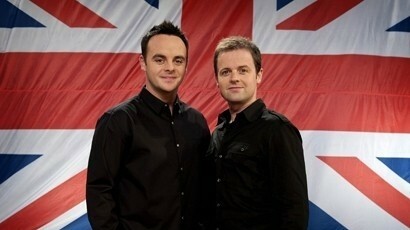 Ant: We’ve had some really good bands, and boy bands as well, which are great for BGT as they rarely audition. Dec: Some great comedians and magic acts too, so a real mix of high quality acts. Ant: There was someone who played their teeth which was very bizarre. You think you’ve seen it all and you haven’t. Dec: We also had our first female ‘female impersonator’, a woman pretending to be a drag queen! Does the British auditioning public still surprise you? Dec: The British public constantly surprise you with weird and wonderful things. You think a) why, and b) how did you even discover you can do that! Any memorable backstage moments from the audition tour? Dec: There have been loads of memorable moments this year. You’ll see a lot more backstage goings on this series. Ant: We had more cameras backstage than ever before to catch all the action, and show more of the reality at the auditions. Dec: We’d like to find an act that could be a global star. Ant: With Simon being back there’s a lot of emphasis on finding a global act. He’s being harsh because that’s his mission.